The weather bureau PAGASA reported as of 5 A.M today that Typhoon "Ruby" has weakened while moving Sibuyan Sea with maximum sustained winds of 120 kph near the center and gustiness of up to 150 kph. 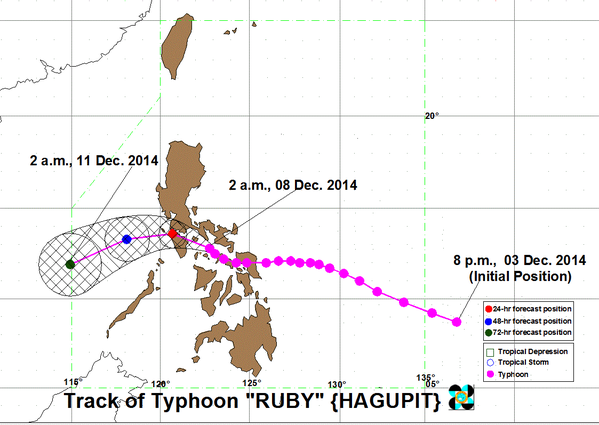 Local weather bulletin posted that "Typhoon "‪#‎RubyPH‬" was located based on all available data at 110 km Northwest of Masbate City or 50 km Northeast of Romblon, Romblon (12.8ºN, 122.7ºE)." According to PAGASA, "Typhoon Ruby was still moving slowly at 10 kilometers per hour and would make a landfall over northern Mindoro island between 6 and 8 p.m."
And today, Metro Manila may feel the typhoon's full effects between 8 to 10 p.m. Comments or suggestions about "PAGASA: Bagyong Ruby Update for Dec. 8, Monday" is important to us, you may share it by using the comment box below.